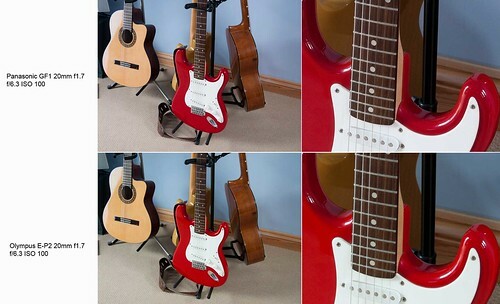 This is a set of comparison pictures between a Panasonic GF1 and an Olympus E-P2. The same lens - a Panasonic 20mm f1.7 - was used. The cameras were mounted on a tripod and an aperture of f/6.3 was selected. ISO's from 100 to 3200 were selected and a small area was enlarged. These were processed identically from raw files using Adobe Camera Raw in Photoshop CS5, using the Camera Raw Defaults settings. Nothing was done to the files in Photoshop and they have been saved as jpgs with the point of focus enlarged. If you click the image through to flickr there are some larger sizes to view available. For the purposes of this test both cameras were returned to their default factory settings. The comparison shows several things. Firstly the Olympus images are softer at all ISO settings. The reason becomes obvious if you look at the guitar strings. 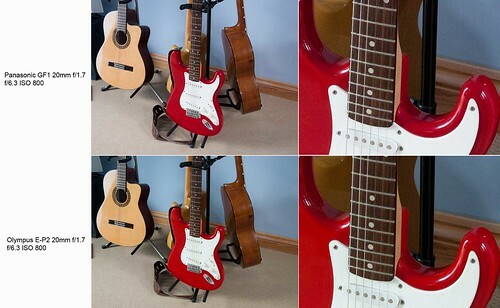 There is slight moire on the Panasonic images, indicating that there is probably a stronger anti-aliasing filter on the Olympus. 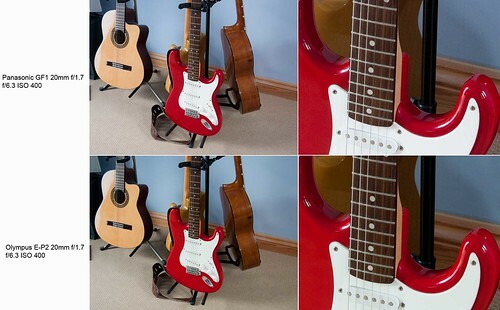 This results in the Olympus images having a slightly "smoother" look. Neither are particularly good at high ISO's. The colour from the Olympus is the most accurate. 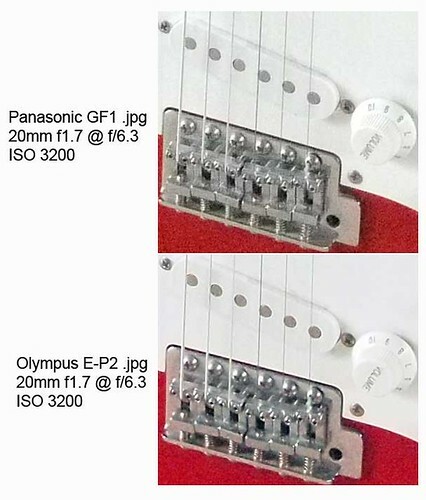 I've included this example of details from two in camera jpgs from each camera at ISO 3200. Olympus have chosen to throw so much noise reduction at this that the letters V and E from the word volume have almost been obliterated. This all illustrates why I have a "problem" with Olympus. Having owned 2 of their 4/3 DSLR's and all of their m4/3 cameras I have always been disappointed with the slightly soft results that I have got. If as seems likely, they prefer a quite strong anti-aliasing filter, then I can't help but feel that they are "neutering" their lenses somewhat. To my mind Olympus have the best camera designers in the world and in their 4/3 lens range one of the best (if not the best) collection of optics designed specifically for digital cameras. I think that its slightly sad that I have to use my Olympus lenses, both 4/3 and m4/3 on Panasonic cameras to see them at their best. As ever this is my personal view. As should be obvious by now, I am somewhat obsessed by sharpness in my images. To me its what I value more than anything. Its why I choose to use Leicas, which have no anti-aliasing fllter. Yes there is moire evident in most of my Leica M9 shots. But it is very easy to remove with no reduction of the sharpness. Thats why I prefer the GF1 images over the Olympus E-P2. With a sophisticated noise reduction programme I can remove some of the noise from the GF1 shots while still retaining the sharpness. It is more difficult to sharpen an image without adding to the noise. Many photographers, myself included, would rather have a sharper, noisier image than a softer image with less noise though others may prefer the opposite. We would of course all prefer sharp, noiseless images at all ISO's, but at the moment we aren't going to get that with m4/3. While at no time suggesting that Olympus use some of the detail obliterating noise reduction that is seen in some compact cameras, I wish that they would opt for a different approach. I see the same thing happening in the E-5. I would loved to have bought an E-5 and it has everything I would want except for the most important thing of all, good image quality at all ISO's. I wrote before that if it produced the same results as the GH2 I would have bought it like a shot. Yes it produces stunning images at ISO 100 and 200, but I expect more from a pro-spec camera at ISO 400 and higher. I'm an Olympus fan. Yoshihisa Maitani, their recently deceased designer was one of the great artists of camera design, they are and always have been, an innovative company. They have produced great cameras like the OM10 and the Pens, their lens range is superb. I just wish they would be a little braver and give us a sensor that finally produces the results that their cameras and lenses deserve.